The neighborhood of Carmel Valley Village, Los Tulares, Sleepy Hollow is located in the heart of Carmel Valley. This region is highly sought after as it allows homeowners all of the charms, tranquility and beautiful natural surroundings you find living in the country while maintaining an incredible location near the Village and within close proximity to everyday conveniences. It is just secluded enough to feel as though you are hundreds of miles away from the hustle and bustle of modern life, yet a short drive away from all of the world class shopping, dining, golf and recreation you desire. Homes are situated on large lots which allows for bountiful gardens, small vineyards, guest quarters, swimming pools and equestrian facilities. Sleepy Hollow is located at the southern end of the neighborhood boundaries, Toyon Way in the Los Tulares development to the north, Garland Park borders to the west and Via La Gitana to the eastern boundary. The neighborhood encompasses Carmel Valley Village which is the heart of the Valley’s dining and wine tasting establishments. Sleepy Hollow is home to incredible equestrian estates of high quality craftsmanship and on large parcels of lush land. Here you will find exquisite homes in a quintessential Carmel Valley setting of pastoral elegance. Los Tulares homes are located off of Carmel Valley Road at the entrance to Via Los Tulares Road. As you wind up the road to higher elevations you will find stunning valley views. It is a quiet enclave of homes with sunny southern exposure and truly remarkable views. Carmel Valley Village homes are those in closest proximity to the Village which has become a destination spot for those out enjoying the sunshine to enjoy a leisurely lunch, shop antiques or wine taste a variety of local winery offerings. Tasting rooms have popped up along Carmel Valley Road providing locals and tourists alike with a chance to sip a sampling of gorgeous wines including the Point Noirs the Valley is famous for producing. There are a few notable restaurants including the Corkscrew Café which is owned by Walter Georis of Casanova and La Bicyclette, two of Carmel-by-the-Sea’s best restaurants. Here you can sit outside on a patio reminiscent of dining in the Mediterranean with olive trees, trickling water and beautifully prepared dishes. Café Rustica is another perfect spot for lunch or dinner offering casual but elegant dining in the cozy stone interior or sun drenched patio and heated veranda. The freshest ingredients and friendly waiters make for a magical meal…don’t forget to share the orange croissant bread pudding for dessert, a must. Click here to view all Carmel Valley homes for sale in the Carmel Valley Village, Los Tulares, Sleepy Hollow neighborhoods. 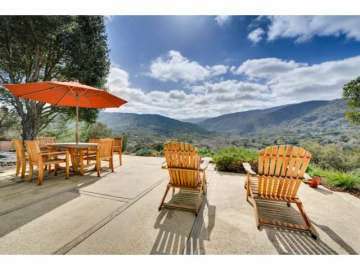 For all available Carmel Valley real estate, click here. In 2018, 53 homes sold in this neighborhood. The most expensive home to sell was an equestrian property with a main house and separate guest house located in the gated community of Sleepy Hollow, complete with a custom barn and swimming pool and selling for 3.165 million. The least expensive home sold for 337,500 for a 2 bedroom, 1 bathroom contractors special with 720 SqFt of living space on a 3,534 SqFt lot. In 2017, 30 homes sold in this neighborhood. The most expensive home that sold, sold for 1.66 million for a 4 bedroom, 4 bathrooms with 3,507 SqFt of living space on 1+ acres, complete with a pool. The least expensive home that sold, sold for 510K for a 2 bedroom, 2 bathroom, 1,325 SqFt of living space on 2,916 SqFt lot complete with a pond. In 2016, 36 homes sold in this neighborhood. The most expensive home that sold, sold for 2.59 million for a 4 bedroom, 4.5 bathroom home in the gated, Sleepy Hollow community with 5,032 SqFt of living space on 8.83 acres. The least expensive home that sold, sold for 300K for a 2 bedroom, 1.5 bathroom contractors special, 1,744 SqFt of living space on 3.18 acres. In 2015, 33 homes sold in this neighborhood. The most expensive home sold for 2.164 million for a 6 bedroom, 6.5 bathroom 1930’s Comstock Adobe with 3,846 SqFt of living space on 8.87 acres. The least expensive home that sold, sold for 170K for a 1 bedroom, 1 bathroom fixer with 554 SqFt of living space on a 10,000 SqFt lot. In 2014, 31 homes were sold in this neighborhood. The most expensive home to sell, was Merv Griffin’s former Ranch house on 57 acres with 9,378 SqFt of living space and sold for 4.5 million. The least expensive sold for 350K and featured 962 SqFt of living space on 41,960 SqFt of land. In 2013 the most expensive home sold in the neighborhood sold for 1.695 million and was a 4,000 SqFt home on a 109,335 SqFt lot, while the least expensive sold for 324K and was a 868 SqFt home on 6,900 SqFt of land. In 2012 the most expensive home sold in the neighborhood sold for over asking at 3 million. This French Normandy estate had 8,200 SqFt of living space on a 5 acre parcel with a spectacular pool, home theatre and the finest of finishes. The least expensive home sold was a bank owned cottage with 1 bedroom and 1 bathroom and just 419 SqFt of living space. Living near Carmel Valley Village is highly sought after and desirable. You will have immediate access to the charms of the Village and the essence of the Carmel Valley. And with an average of 300 days of sunshine a year you will experience heavenly weather and take advantage of all the outdoors have to offer. Though the beauty of Carmel Valley does not diminish as you travel down the Valley Road into the more remote areas, it can be just that-remote and poses its own set of challenges. To be close to the Village is a central location where you are never far away from modern day conveniences and only a short drive away to the coast where there Carmel-by-the-Sea, Pebble Beach and Monterey offer superb entertainment, recreation and conveniences. If you ever tire of the sunshine, though few do, a drive to the coast in the summertime will cool you with its natural “air conditioning” of marine fog. Whether you choose an estate in Sleepy Hollow where you can rise early on an autumn day to care for the horses and prepare for a brisk trail ride or a home in Los Tulares where you can relax on you deck, sip a glass of wine and soak in the views, or a home in the Village where you can walk to a casual dinner with friends and sit alfresco and enjoy a culinary delight, your home will be a treasured retreat in its ideal Carmel Valley locale.